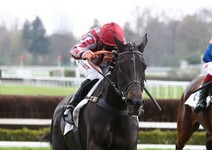 Back on course following eleven months’ off the track, the François Nicolle-trained campion mare, De Bon Coeur, got straight back down to business on Sunday at Auteuil, outclassing her seven rivals in the Grade 3 Prix Hypothèse. Despite the winner’s performance, it is hard to fault second-placed Crystal Beach, who finished 2½ lengths ahead of Galop Marin who had led for much of the race. Nicolle’s second runner, Alex De Larredya, was not far off in fourth but still has ground to make up on his stablemate. Vangel De Cerisy was a surprisingly lacklustre and distant fifth.